Cool ankle boots: It’s a given that a good pair of booties are a staple for fall, but this year I’m coveting more interesting pairs with ones with cut-out details and embellishments or ones that are in an unexpected colour (like wine!). Chunky knits: I don’t think I need to explain myself here. Backpack: It’s time that I finally cave and buy that $50 backpack that I’ve had my eye on for several seasons now. Nothing’s more practical than a backpack! Boyfriend jeans: As I retire my shorts, skirts and dresses, I’m vowing not to wear tight and uncomfy skinny jeans again. Who’s with me?! 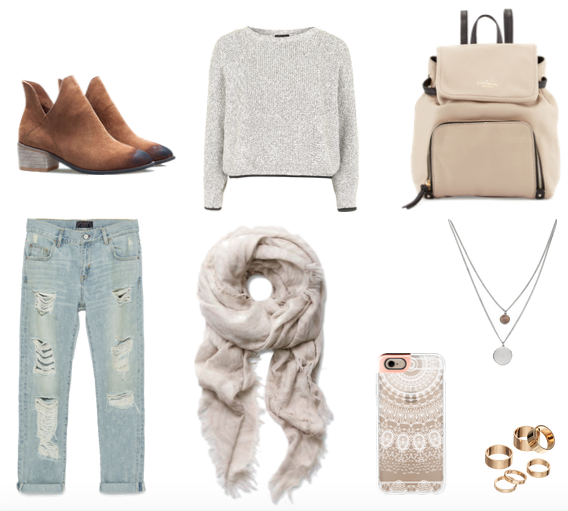 Scarf: Aritzia blanket scarves = love. Sure they cost a full days pay, but they’re versatile and worth it. Clear iPhone case: Do they make these for the iPhone 5? If so, I need one. They’re simple and cute and make the most perfect accessory. Minimalist jewellery: I haven’t fully given up chunky jewels, but simple chains and dainty midi-rings are the items I am more attracted to lately. Follow my on Twitter for more of my must-haves and random thoughts.